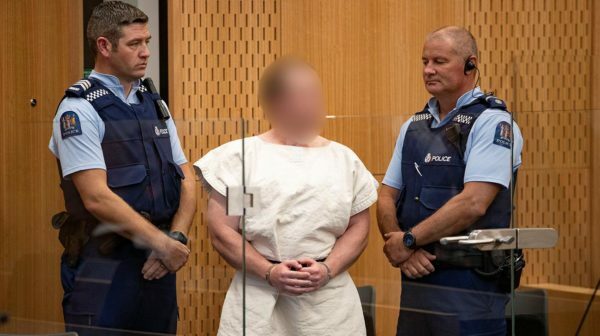 A 28-year-old Australian suspected white supremacist was charged with murder on Saturday after 49 people were killed and dozens wounded in mass shootings at two New Zealand mosques. Handcuffed and wearing a white prison suit, the suspect stood silently in the Christchurch District Court where he was remanded without a plea. He is due back in court on April 5 and police said he was likely to face further charges. The attack, which Prime Minister Jacinda Ardern labelled as terrorism, was the worst ever peacetime mass killing in New Zealand and the country had raised its security threat level to the highest. The alleged gunman has been identified as a suspected white supremacist, based on his social media activity. The video showed a man driving to the Al Noor mosque, entering it and shooting randomly at people inside. Worshippers, possibly dead or wounded, lay on the floor, the video showed. One man who said he was at the Al Noor mosque told media the gunman burst in as worshippers were kneeling for prayers. “He came and started shooting everyone in the mosque, everywhere,” said Ahmad Al-Mahmoud. He said he and others escaped by breaking through a glass door. The suspect was arrested in a car, which police said was carrying improvised explosive devices, 36 minutes after they were first called. Ardern said the suspect was a licensed gun owner who allegedly used five weapons, including two semi-automatic weapons and two shotguns, which had been modified. Police Association President Chris Cahill the semi-automatic weapons used in the mosque shootings were banned in Australia after the Port Arthur massacre in 1996 in which 35 people were gunned down. “There is no place in the upcoming debate for the radical gun lobby which has made its presence felt in previous attempts to make our country safer,” Cahill said in a statement. Twelve operating theatres worked through the night on the more than 40 people wounded, said hospital authorities. Thirty-six people were still being treated on Saturday, of which 11 remained in intensive care. One victim died in hospital. Funerals were planned on Saturday for some of the victims, several of whom were born overseas. Wearing a black scarf over her head, Ardern hugged members of the Muslim community at a Christchurch refugee centre on Saturday, saying she would ensure freedom on religion in New Zealand. “I convey the message of love and support on behalf of New Zealand to all of you,” she said. US President Donald Trump, who condemned the attack as a “horrible massacre”, was praised by the accused gunman in a manifesto posted online as “a symbol of renewed white identity and common purpose”.